Roasted chickpeas are highly addictive, crunchy and nutritious! What more does one need in a snack? Oh and I forgot to add that they are really easy to make. These delicious oven roasted chickpeas are truly a guilt free snack to keep handy. Open the chickpeas tin and drain well. Spread the chickpeas on a paper towel and blot with another paper towel on top so that they are totally dry. You can also make your chickpeas from scratch by picking up dry chickpeas from the store and boiling them. It is very important that the chickpeas are absolutely dry. Heat the oven to 400 degrees F. Now spread the chickpeas on a baking tray and bake for about 35 minutes. 3. Remove the tray from the oven and add the oil and seasoning to the chickpeas and toss well. Then put the baking tray back in the oven for another 10 mins. Now close the oven but let the tray remain inside till cool (about an hour). 4. Remove from oven. Enjoy the perfect and crispy chickpeas! 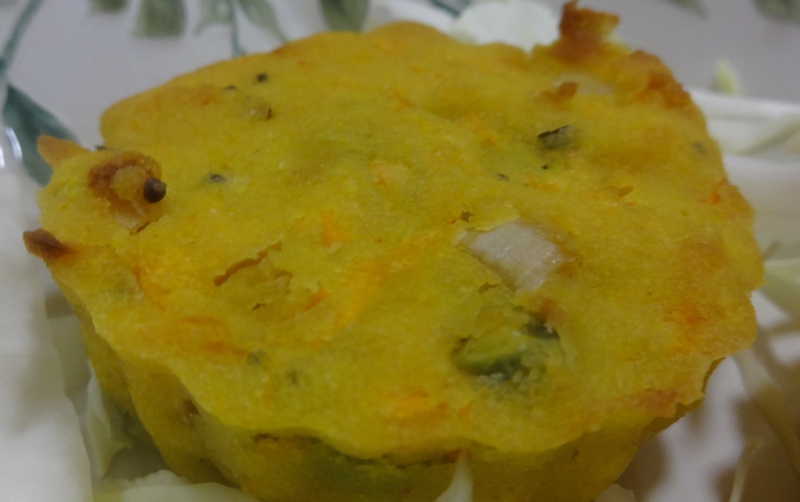 Fried plantain is a dish cooked wherever plantains grow, from Latin America through West Africa to East Africa and the Caribbean such as Jamaica, and in many parts of Southeast Asia. 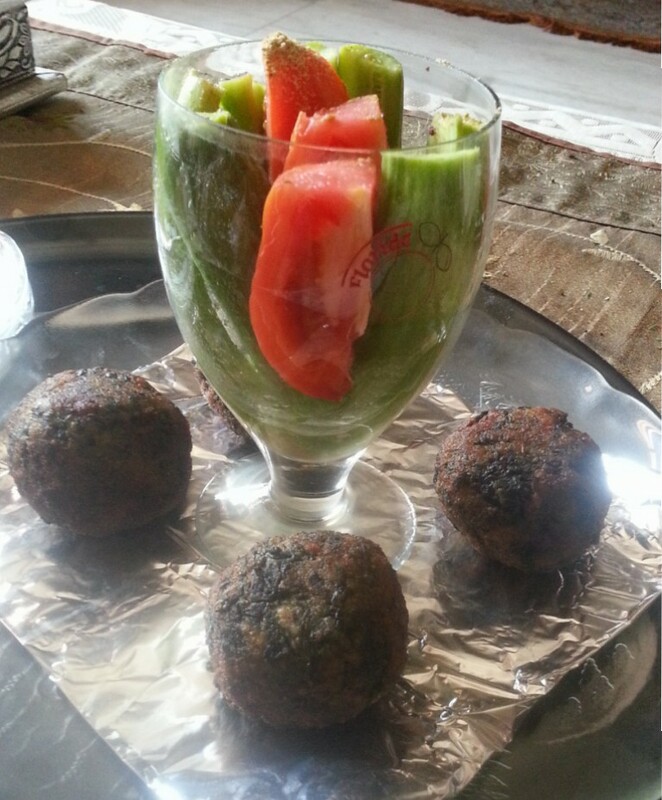 This is a quick and easy snack which tastes delicious too! This recipe was sent to me by Peter, my daughters fiance. Thanks Pete! 1. Drizzle oil into frying pan just enough to coat the bottom of the pan and place on medium heat. 2. When oil begins to shimmer, add plantains (work in batches), and fry for 1 and 1/2 minutes on one side, flip and cook for 1 minute on the other side. 3. Remove plantains from pan and drain the excess oil by placing them on paper towels. 4. Sprinkle with lime and salt. Enjoy! Who does not enjoy chips? So here is a much healthier version – sweet potato baked chips which you can enjoy guilt free. My daughter, Ria, tried these out and loved them. 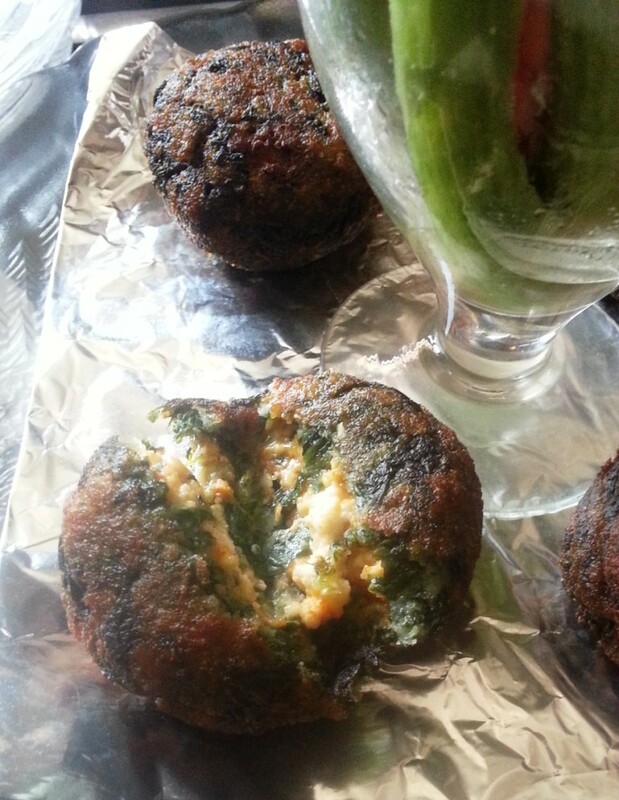 She encouraged me to make them and they were easy, flavorful and nutritious. These awesome chips require only olive oil, sea salt and pepper. Rinse and dry the sweet potatoes. Cut them as thin and evenly as possible. Know that chips that are too thick in parts won’t crisp up all the way. Still delicious, just not “chip” crispiness. Toss the slices in olive oil and add salt and pepper. 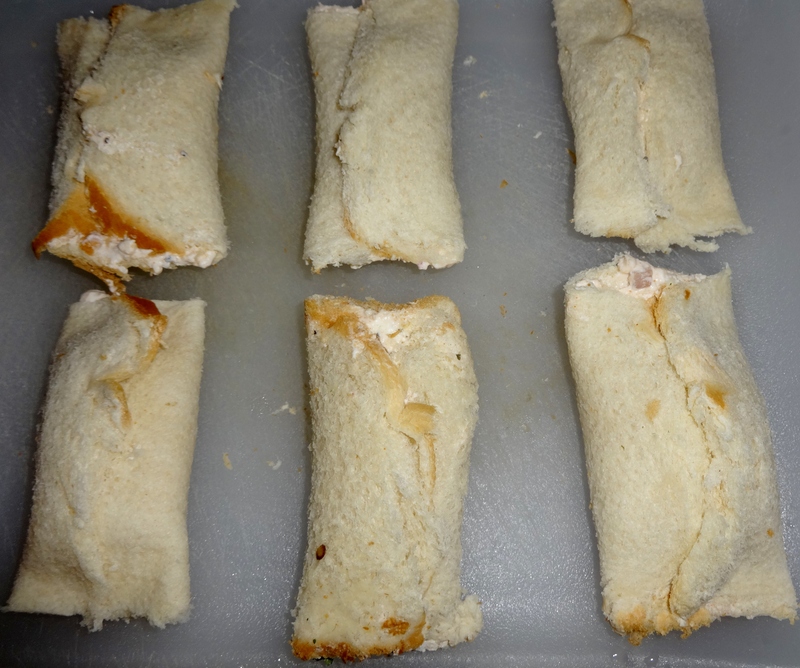 Spread evenly on a baking tray in a single layer. Place the baking tray in the middle rack in the oven. 4. Remove once crisp and golden brown(about 35 mins). But each oven varies so you will have to keep an eye on them. Some may feel a little tender in the middle but take them out and let them rest for 10 minutes or so to crisp up before sampling. Serve immediately. Rains have finally hit Delhi and the weather has suddenly improved! This called for celebrating with a new recipe. These delightfully flavorful and nutritious cupcakes are made from semolina (suji) and have lots of healthy veggies. This is a super easy dish to make for breakfast or when you have guests over for high tea! 2. Take a muffin tin and grease it. 3. In a bowl mix semolina, yogurt, chili powder, turmeric powder, salt and all the vegetables including onion, ginger, green chili. Add water to make a smooth batter. 4. In a small pan, heat 2 tbsp oil ,add mustard seeds,when it starts crackling, add cumin seeds and curry leaves. Pour this oil in the semolina batter and mix well. 5. Mix baking powder and baking soda into the batter and stir well. Pour the batter into the muffin tin. Garnish with sesame seeds and bake for 35-40 minutes. 6. Serve hot with mint chutney or tomato ketchup. Salt, red chilli, chaat masala to taste. 1. 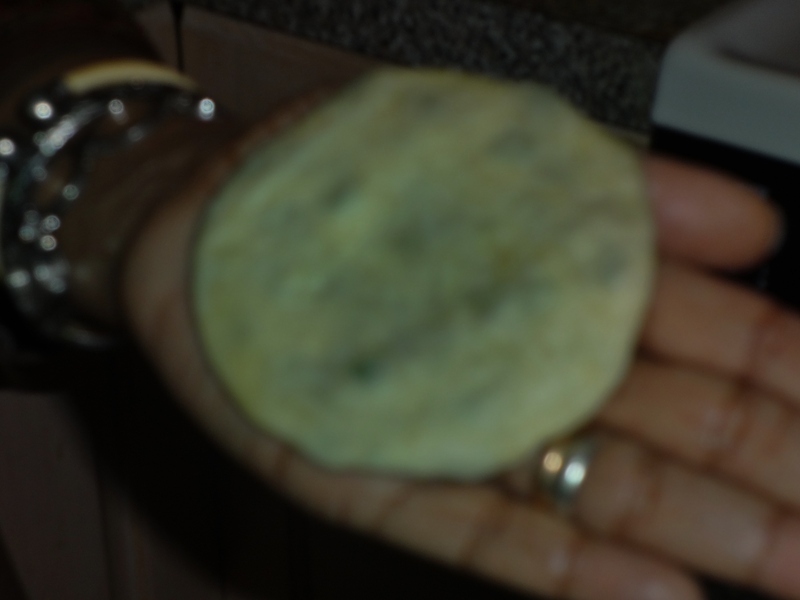 Knead the bread pieces with the boiled spinach in a bowl..The water of the spinach is enough to make the dough- if too dry then add 1 tbsp of water. Season with salt to taste. 3. 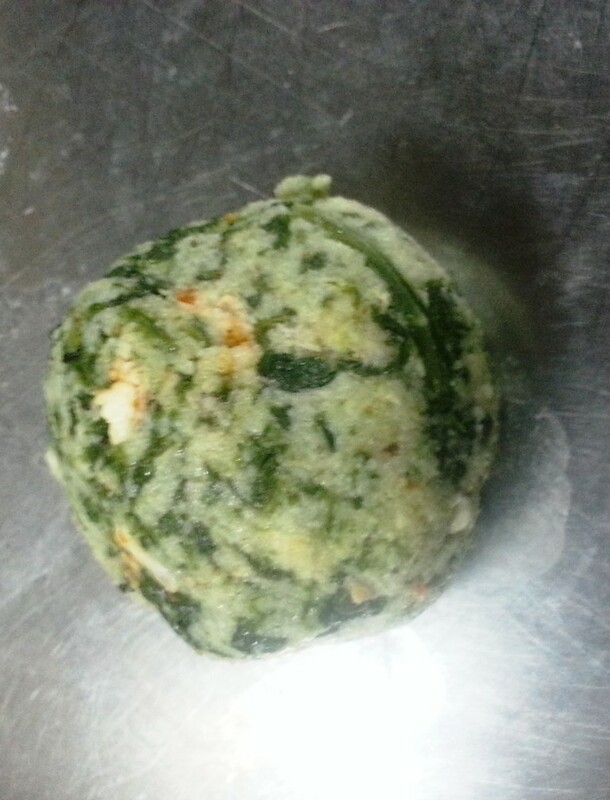 Make small ball of the dough, and make space to put the filling inside. 4. 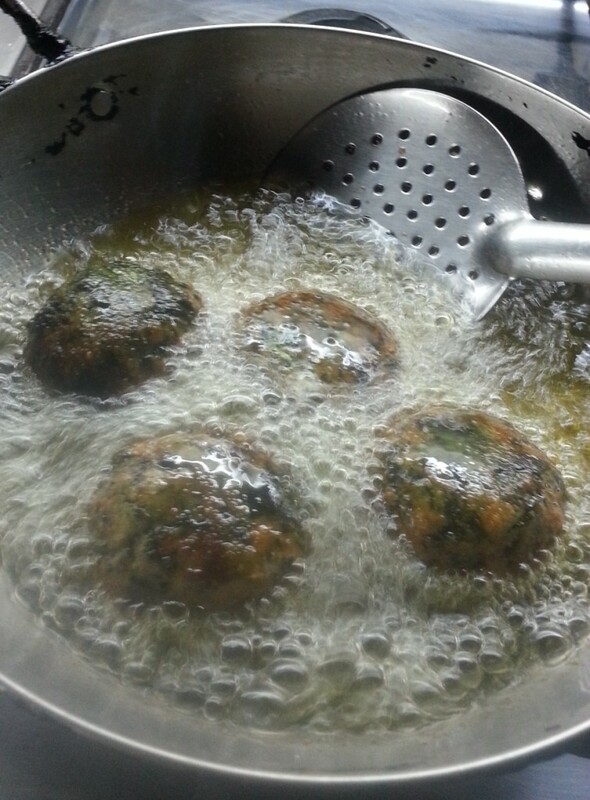 Let balls rest in fridge for half hour and then deep fry. Serve hot with salad and sauce! 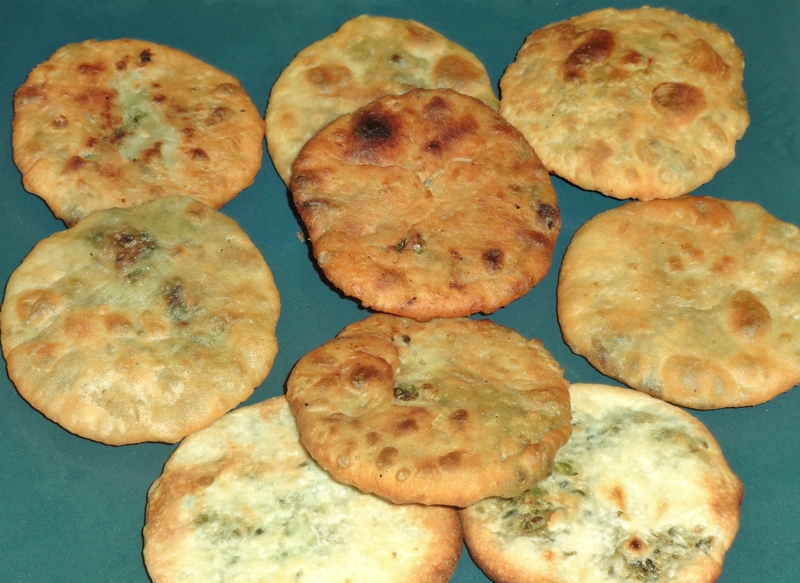 The next dish that Pratima demonstrated was matar kachori (stuffed peas bread). They were delicious and we just couldn’t stop eating them! 1. Heat 1 tbsp oil in a pan and add the peas. Toss in the spices and hing and ginger/chilli to peas. Stir well and cover cook till tender. 2. 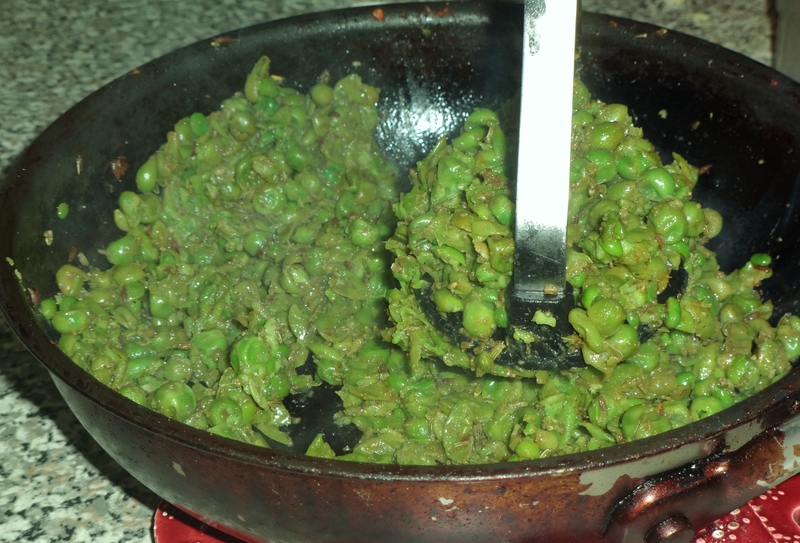 Coarsely mash the peas with a heavy spoon. Keep aside. 4. Add water to the flour and knead well. Leave covered with wet cloth for 20 minutes in warm place. 5. Roll out to 2-3 inch rounds, and fill each with 1 tsp of pea mixture. 6. Secure ends well, and pat to 3-4 inch small rounds again- taking care that the filling does not spill out. 7. Deep fry till golden brown ( tip- put in hot oil, turn gently and fry on low flame- they will swell up ). 8. Serve hot with green coriander chutney or tamarind sauce. 9. 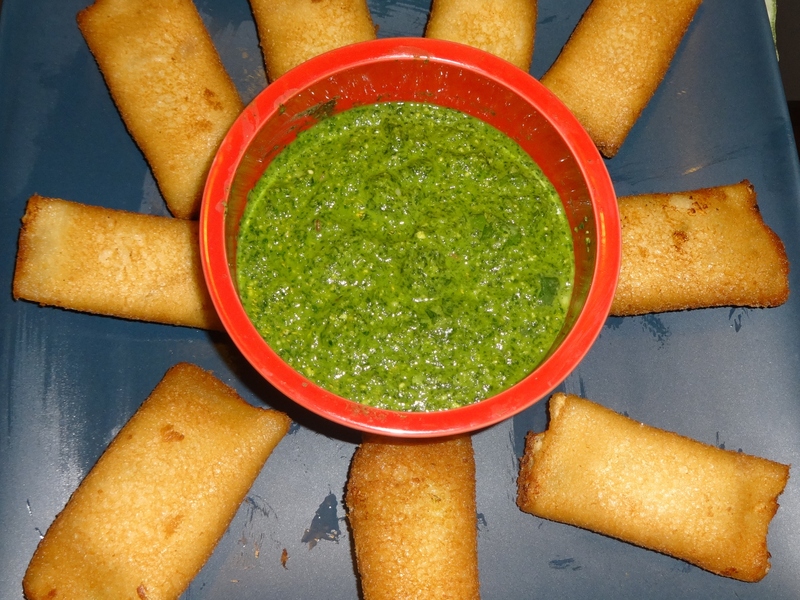 Serve hot with green chutney!